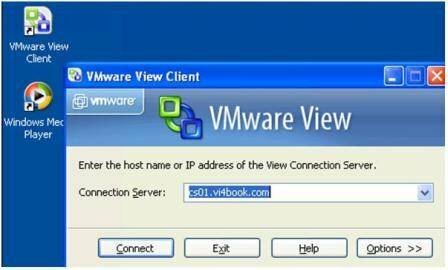 Follow this step-by-step guide to publish an individual virtual desktop with VMware View. 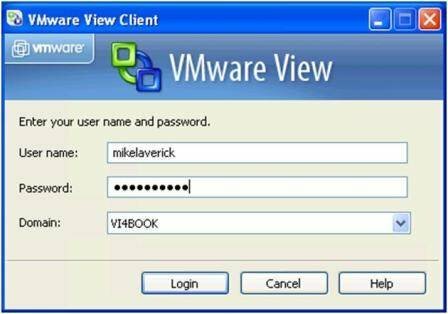 This is the third article in a series on the basics of VMware View. With all the VMware View software now installed, we are now in a position to publish our first desktop. I like to do this as soon as possible so I can ensure that the View Client can connect to the Connection Server – and in turn connect to the Virtual Desktop running the View Agent. Once I'm satisfied that the virtual desktop works I think about making a template out of it – and creating larger pools of virtual desktops. After all there's little point in creating a pool of 100 virtual desktops if the source of that pool is broken or doesn't work properly. One way of publishing a virtual desktop is creating one virtual desktop per user, and ensuring that only that user has rights to a particular virtual desktop. This can be a requirement if your virtual desktop users are "power users" who have their own unique desktop software with their own custom settings. 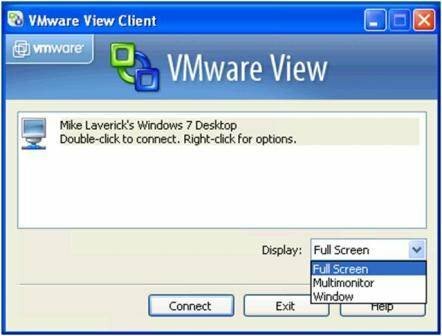 VMware View calls it an "Individual Desktop" – a single virtual desktop intended for one specific person. It is possible to assign an individual virtual desktop to more than one person. On the surface this might seem an oxymoron. But if you're looking for a usage case, I often see one PC being used by different people at different times in factories and production environments. 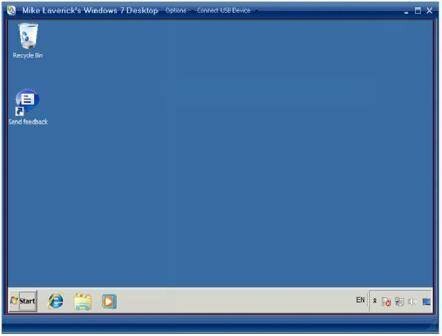 Remember though that unlike Microsoft Terminal Server or Citrix XenApp Server only one person at a time can connect to a Windows XP/Vista/7 client desktop. In other words these clients do not support the concept of "multi-win". Next you must specify a unique ID for this virtual desktop together with some friendly information by which the end-user will be able to identify the virtual desktop (Figure 3). The ID must be unique to this instance of VMware View and is stored in the Microsoft ADAM system. Once it is set it cannot be changed – but the friendly information can be changed at any time. The next page allows you to control some per-virtual desktop settings which center around the end-user connection (Figure 4). The purpose of suspend or power off options is to free up memory and CPU resources for other users when the virtual desktop is not in use. This is a great idea in theory, unfortunately many users get irritated by the time it takes to resume a VM or power it on. You know what end-users are like don't you? They expect things to work, like IMMEDIATELY! The disconnect feature allows a user to start a process – disconnect – and then return to the virtual desktop when they like. It's an incredibly useful feature especially when a user kicks off a process that takes a long time to complete. Additionally, this "disconnect and reconnect" feature is handy if the end-user has a temporary network outage. However, some organizations regard this ability to reconnect as a security weakness and a waste of resources – therefore it is possible to logoff the session either immediately or after a certain duration. Finally, the "Allow user to reset their desktop" options allows the users to reboot the VM if they think it has become unresponsive. This is not a default option – but I prefer it because it gives the end users a chance to fix their own problems perhaps before calling the help desk. Next you select the virtual desktop that the end-user should have (Figure 5). In my case I am actually running Windows 7 64-bit even though it is not officially supported. I changed the Guest Operating System type to Microsoft Windows Vista (32-bit) in order to force VMware View to list this VM (Edit Settings >> Options >> Guest Operating System). At the time of writing VMware View does not support Windows 7. The TestXP VM is a test virtual machine that does not have the View Agent installed. By default View shows ALL Windows client operating systems in this list regardless of whether they are virtual desktops with the View Agent installed or not. You can prevent these from appearing in the View Admin tool by changing the account used by View, making sure that the account does not have access to these "test" VMs. It perhaps worth mentioning that once the virtual desktop is assigned in this part of the wizard it cannot be modified from the web-page administration pages – so get the assignment right now or else you will be deleting this reference in View and starting again. 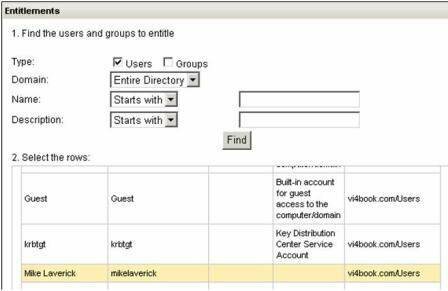 After clicking Next and Finish, this will then create a personal desktop in VMware View; the next step is making sure only the right user has access to the desktop – VMware calls this process "entitlements". 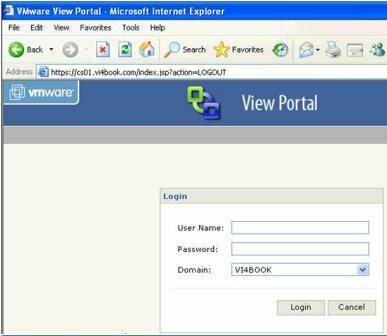 Select the virtual desktop in the list and click Entitlements (Figure 6). Click the Find button and locate the correct user, in my case Mike Laverick (Figure 7). Notice how the find option defaults to locating just users and not groups as well. That's fine in this case – but when we come to create pools of virtual desktops – it will be best to use groups from the Active Directory – so that the Sale Group gains access to the Sales Virtual Desktop for example. Now that the virtual desktop is created and entitled we can use the client to attempt our first connection to the virtual desktop. The screen grabs below show this process from the end-user's perspective (Figures 8 through 12). In the next section, learn about publishing virtual desktop pools. Hi Mike, I am trying to build a demo server (which would be used as a client by online users) that would be pre-loaded with a WebToken, to open additional discount prices from a ecommerce discounts web service. The service already exists but there's no way a non-already-paying-user can actually browse the discount prices dynamically to make a decision if the service is worth the monthly subscription, and that's what I am trying to build now. This web server would need to be accessible online for an "n" number of anonymous users. My test environment is already suing GCP infrastructure. I think VMWARE would allow a single physical server to offer many virtual independent servers, but since I am already using a Virtual infrastructure I believe VMWARE server would not work in GCP, as in, creating different virtual instances in the same (GCP virtual) server. Anyway, using VMWARE, I think it would be possible to deploy 4 or 5 different VMWARE resources at different GCP instances and assign a username/password to each individual computer for Web URL access to the online server, just to leverage from this feature. But still, there's a problem ... I can choose the same username/password for each individual GCP machine, but If I post those URLs online in my site to invite anonymous users to browse the demo service, I dont't see how I would be able to direct these new users only to the virtual machines not already taken by other online users in their own demo session. I 'd be looking for a connection broker of some sort that would be capable to redirect from the same URL towards the virtual machines not already in temporary use by the latest anonymous users that arrived chronologically before. Is there somehow this can be achieved with VMWARE?